I love Netflix. I am serious… I love it. I grew up watching movies as a special Friday night treat with my family, so snuggling up on the couch with some popcorn is nothing short of a perfect night for me! A few weeks ago I stayed up watching The Guernsey Literary and Potato Peel Pie Society on Netflix. It was so good guys, I highly recommend it. While the movie has little to do with potatoes, I have found myself craving them ever since. Long story short, I have no idea if it tastes like hers, but we sure liked it. Preheat the oven to 400 degrees and grease a 9 in round cake pan. Heat 1 Tbs of olive oil over medium heat in a large skillet. Once the pan is hot, add the potato noodles, half of the salt, half of the pepper, and all of the garlic powder. Stir until combined. Cook noodles over medium heat for 5-8 minutes, or until al dente. Remove from heat. In a large bowl, combine the warm water and ground flax seed. Stir slightly and let sit for 2 minutes. In the same bowl, combine the cream cheese, mozzarella, butter, salt and pepper with the flax mixture. Use a spatula to combine completely. 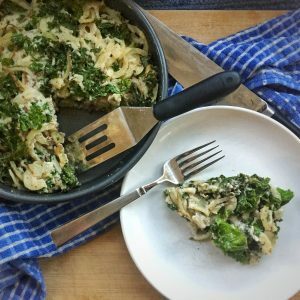 Mix in the chopped kale and potato noodles. Continue to stir until everything is combined. Pour mixture into greased baking dish. Make sure you scrape down all the creamy mixture from the bowl! Bake in the oven for 30 minutes, or until the top begins to brown a bit. Remove from oven and let cool for 5 minutes before cutting. Enjoy!